If you saw my post on Wednesday, you may have seen me mention this combo top. It’s a sleek basic I snagged while shopping around Bath earlier this week. I’m obsessed! I was first drawn to it for it’s long hem and effortless layered look, but the softness of the knit on this top sold me. It looks classic and polished when paired back with my favorite leather leggings (similar pair here), don’t you think? Because the layering of the sweater and blouse is done for you, this top is literally the easiest thing to throw on and walk out the door. Instant chic. If you, like me, love this layered look, I urge you to peruse a couple more of my favorite combos below! 1. Remember Clu? This sweater dress is a cozy option for casual weekends this fall. 2. If you’re a stripes fanatic, check out this top. 3. This Marc by Marc Jacobs top + sweater combo is similar to mine, but without the collar. 4. Borrow from the boys with this navy and striped shirt look. 5. This Thakoon Addition top is ideal for spring transitional style. Love! I am loving the long layers here – and how easy that it’s just one piece! 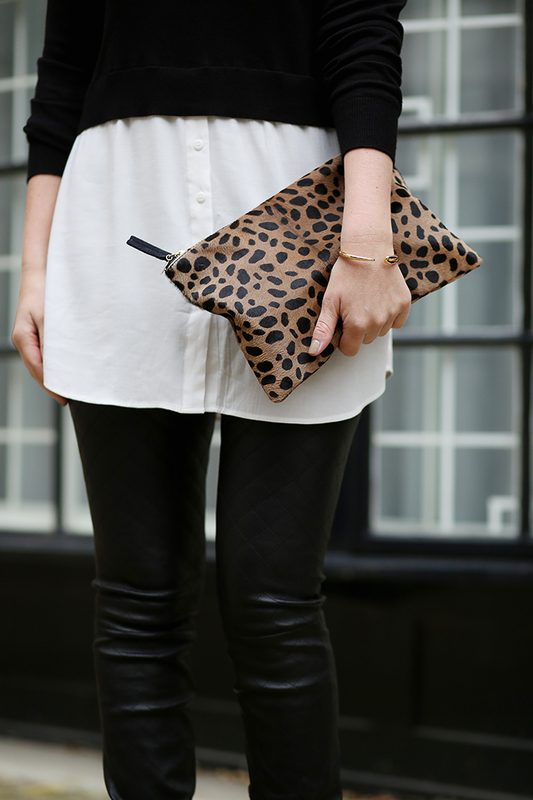 I love the way you added a little bit of edge to such a polished look with the leather pants and leopard. these leggings are awesome, love the quilted details. Also love this hairdo. I have a similar top to this, and I love it. I’m ready to break it out for fall. Looks lovely with your heels and leopard. This top is so chic – love that it’s all one piece so you don’t have to deal with the bulkiness of layering two shirts together. Great look! 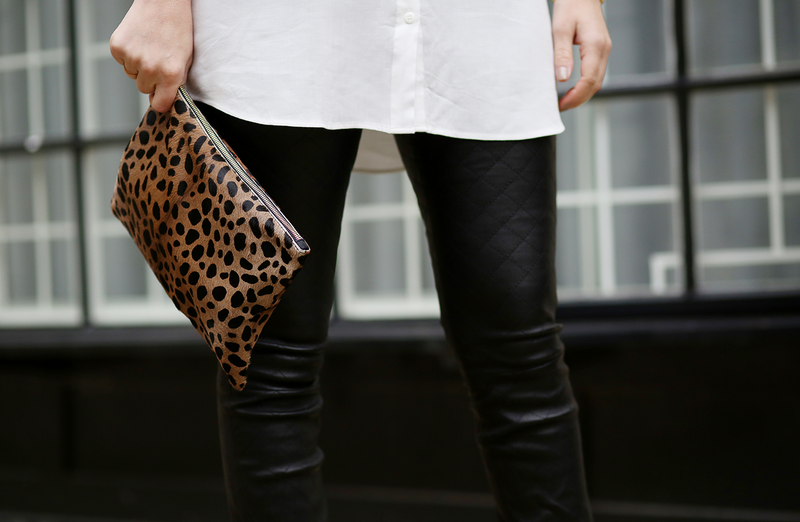 Love your leopard clutch! Miss you! I feel like you’ve been gone forever! That is such a cute top/sweater! I like how you styled to with those leather leggings. You created a fabulous look! Love the leopard clutch! Have a nice weekend! I’ve been loving all these neutral outfits you’ve been wearing! Great for traveling and so classic! P.S. I’ve been loving following you on Snapchat! Love this look! I need those pants! I love that this top is one piece! I feel like if I were to create this using two separate pieces, it would bunch up funny in areas. Gorgeous look! That top looks perfect! After a summer of brights, I’m loving the look of simple black and white. Love this top! Classic with a bit of edge! Great photos, the outfit and the backdrop really work! Fabulous outfit! Absolutely adore this look! You look stunning! So classic and chic. Love this top on you!! This might be my fav outfit of yours, so pretty! OBSESSED with this outfit. You look incredible, cool, chic, edgy, effortless…. omg, one of my fav outfits on you!! Love it! You could never go wrong with black and white. Love how you styled the clutch with this outfit. Overall perfect look. You look gorgeous. I love this look! Every piece looks perfect! The clutch is the perfect touch! Love this classic ensemble. Black & White and cheetah is perfect. Loveee but also really into your hair pined back like that so pretty! I adore this! So effortlessly chic.